This picturesque stream rises in Glen Isla and these upper reaches have a good population of brown trout that are moderately sized and usually free taking. This is an excellent place for the beginner to start river fishing. In the valley of Strathmore, the Isla settles down to a series of lovely pools and runs and becomes an excellent trout and grayling river. Below the Ericht the Isla acts as a corridor for salmon and grilse that are heading there. Trout and grayling are present everywhere. Its tributaries the Dean, Kerbet and Melgum are nice, small trout rivers. The Ericht and its tributaries the Rivers Blackwater and Ardle have good runs of salmon and grilse. The Ericht has a series of obstacles that prevent salmon running upstream until the temperature has risen. Some time in May, salmon will have penetrated the upper reaches. This is small river fishing most of the sport on a single-handed rod with small flies. After summer floods the Ericht system enjoys really good grilse runs. The Ericht also maintains a very good trout population. Bleaton Hallet is a remarkably beautiful double bank beat about one mile long that contains a variety of pools, including a lovely set of waterfalls and places for salmon to rest in all heights of water. 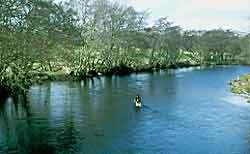 The Blackwater is a very prolific salmon river that fishes well given suitable conditions between the middle of May and 15 October. Like most small rivers it fishes best after rain and before the water has dropped back to summer level. Access is generally easy but wading is necessary. Fishing a light double handed or single handed fly rod rated for an AFTM 7 line is the perfect way to tackle this beat. Casting amongst the trees can be tricky but without the shade they provide salmon would not settle there. Small flies and floating or intermediate lines are best. Sizes 8, 10 and 12 flies and plastic tube flies down to quarter inch do well. Patterns Ally's Shrimp, Stoats Tail, Silver Stoats Tail, Cascade, Munro Killer and Jeannie are recommended. Contact Ally for details. Includes over one mile of double bank fishing on the River Ericht immediately upstream of its confluence with the River Isla and over three miles of right bank fishing on the River Isla. 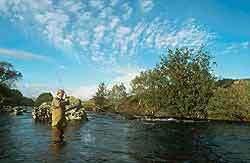 Salmon, sea trout, brown trout and grayling, all methods permitted. Most of the pools on the lower part of the beat are fairly open and easy to fish. Fishing is more challenging on the upper part where the better salmon pools are located. Wild brown trout up to two pounds roam the river presenting a challenge for the angler whilst smaller trout are plentiful. Recommended flies for salmon include black and yellow and Willie Gunn tubes for springtime, Ally's Shrimp, Yellow Ally's Shrimp, Cascade, Executioner, Munro Killer and Stoats Tail for salmon. For trout Greenwell's Glory, Olives, March Brown and Pearl spider. Excellent access. Number of permits is unrestricted. For further details contact Kate Fleming's Shooting and Fishing, 26 Allan Street, Blairgowrie PH10 6AD. Telephone +44 (0)1250 873990 or e-mail Ally. Any private fishing described may be booked by e-mail giving me a note of the dates and number of rods required, subject to availability. A deposit will be requested to confirm the booking. Deposits will be forfeited in the event of cancellation, unless the fishing can be successfully re-let. Guides/ghillies may be provided. 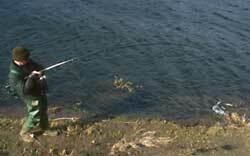 Fly casting and trout, sea trout and salmon fishing instruction of any type can be arranged.